I prefer the other non Velcro one here. Not really fussed too much with the current size, but if you move to bulk packs then think it needs to be an airtight seal. I quite like the velcro locks, much more than the older ziplocs. As said the powder in the loc can be creared by simple tapping with a finger. The initial opening was and still is a pain. The good one in that regard were the packs with the pull strip. The irritation is two-fold. First as delivered the powder bulks all the way to the very top so that care is needed when tearing open. I cope with this by tearing a small opening to break the vacuum and then bang it on the table to settle the powder. Are the bags being filled from the bottom side, before getting sealed and shipped? Then maybe it's possible to keep the bag clamped shut just beyond the velcro part, hopefully also keeping the velcro closed so no powder gets in there from the beginning. The bags are filled from the top, so that won't be possible unfortunately. Thanks for the great suggestion though! 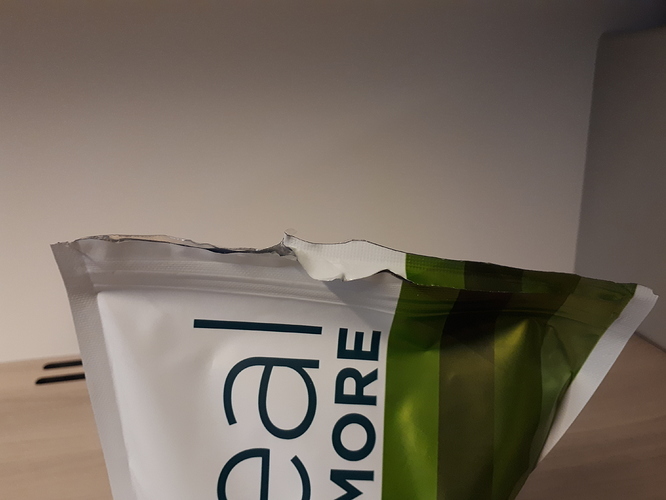 Open a new bag by tearing the top off, just so air can get in. Hit hard surface with the bottom so the powder drops. Tear the rest off for a spill free experience! Hit a hard surface with the bottom a couple more times to remove the left of the powder from the slosing strip for better sealing. This is really my problem, too, spilling powder all around. I make a full bag with a blender, and there is almost always powder going somewhere it's not supposed to. The new bags might be easier to reseal (I haven't tried that yet) but the old ones where best to open. You could tear of the strop and then at least you only spill powder when trying to get it into the blender. I think the ideal bag would have an opening that is much smaller so it can fill a blender or bottle without having to fold the bag onto itself. Of course this isn't really that important, both bags are fine Just wanted to say the new bags aren't better for everybody. I also loved the new velcro-like seal on the new bags, but I also had a problem with tearing up the bag. Most of the times it was still sealed and I had to use a scissor to open it. It's like if the bag was closed below the place where you tear it up. No big deal, just a comment. Personally I'd still love a bulk order (like 10kg). Thanks for sharing this experience @rjlouro, we'll take note of it! As always =) And there were some stickers to pimp my gear, there's no way I can be even slightly mad with you! I must be doing the same something weird that @rjlouro is doing because more often than not I also get it where I tear along the strip and then the bag remains sealed. It's not a massive problem for me because I end up cutting beneath the hook and loop tape (which just gets in the way) and tip the whole contents out into a 1.5L container and, just like @Dejay, mix the whole thing up, which I then consume throughout the day. While they close easily they might still be a bad idea. If you put your face close to the opening and press you can feel air blowing out rather easily. As far as I know the bags need to be closed to not let air go in/out, and these zips just don't do that job. It's more convenient but it's not airtight. And I'd say the conservation and safety should have the priority since we're dealing with food. Good point if that is the case. Hey @phyphor! We're sorry to hear about this, but we're aware of it and we'll try to figure out what goes wrong with our production location. Would you mind letting us know the diet type(s), flavour(s) and batch number(s) of these bags? I agree that they're not airtight but tbh the bags are small enough and the bags are likely closed enough - that any air circulation would be minimal for the length of time a bag lasts- at least around here - ymmv. In other words I decided it wasn't an issue for me. I'd think if Queal were to launch larger bags, they'd go for a more traditional airtight seal on those - since they'd be around longer.. I quite like how the velcro seals, but have to agree that the powder tends to get caught in it. It's my fault since I prefer pouring straight from the bag, though. The bag's a bit too tight for my big hands and I always end up a powdery mess. Since I don't want to go out looking like Charlie Sheen, I place my shaker on a scale instead and pour directly into it after adding water and setting the scale to 0 again. But the "velcro" is easy to clean - just set the bag upright and flick your finger against the outside of the edge.